The aftermath of general weather has already been discussed in the previous section. In this section, the aftermath of severe events are discussed particularly those associated with hailstorms, tornadoes, severe straight line winds, microbursts or downbursts, and flash flooding. As is to be expected, most tornadoes in Australia go unreported. Therefore, the aftermath of tornadoes are important to consider since meteorologists can determine that a tornado has occurred after the event through reports and through damage surveys. When tornadoes pass through different types of areas, the types of damage obviously differs. In residential areas, a tornado will leave a path of destruction affecting buildings, trees, and telegraph poles all along a path. Areas nearby will suffer little or no damage. Depending on the severity of the tornado, the width of the damage path can vary as well as the extent (severity) of the damage. For instance, weak tornadoes may lift off or damage roofs of houses and other buildings and bring down trees and power lines along its path. Trees may be snapped or uprooted. In the most severe cases, everything is levelled. Houses are brought down to their foundation and pieces scattered hundreds of metres mainly upwind. Trees are destroyed and power poles snapped. Cars are also picked up and thrown and therefore are destroyed. In other areas such as forests, tornadoes are more easily recognised. From the air, trees are felled inwards along the path. This is known as convergence at the surface. Winds in tornadoes are rotating violently inwards and therefore trees are also blown inwards. In severe cases, most or all trees are felled with a clear path exposed. In weak tornadic cases, weaker trees are felled. In rural districts, tornadoes can destroy or damage farm houses and sheds, snap or uprooted trees, and pick up or move farm vehicles such as tractors and trucks. Large silos may be shifted or brought down. The key observation here is to observe vast changes with some areas affected and others untouched. Of course, identification is important. Other forms of localised damage can be used to measure severity. 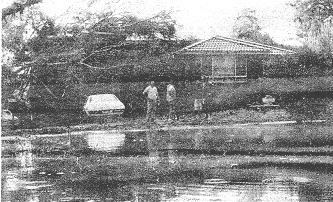 Debris found embedded in other objects such as trees; debri blown into poer lines and trees; tar or concrete being lifted and dumped several metres away; vehicles being lifted or moved up to a few hundred metres; large trees plucked and shifted several metres as well as trees being defoliated are all examples of ways the severity of tornadoes as well as other severe weather events can be monitored within the aftermath soon after the storm. In some cases such as a path of destruction in a forest caused by violent tornadoes can be observed for years after the event. 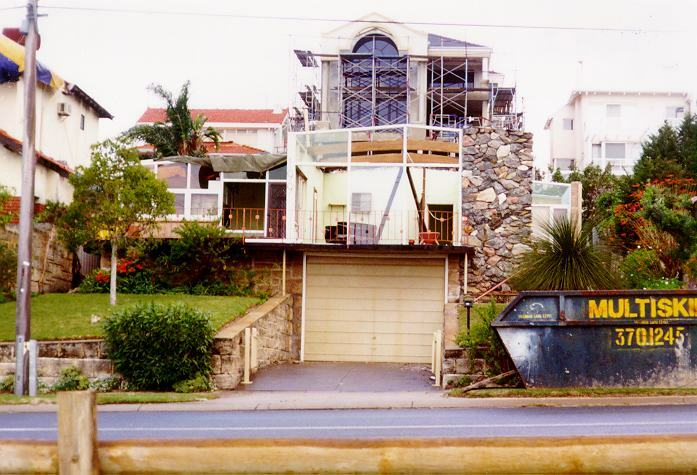 Hailstorms are responsible for some of the most severe damage insurance pay outs in Australia. Obviously the larger the hail, the more damage inflicted. But the damage does not increase marginally with increases in hail size. In other words, if hail doubles in diameter, the damage created is much more severe. Hail with a diameter of 2cm or greater is sufficient to cause damage. It is considered as the cutoff point by the Bureau of Meteorology for severe hail. Depending on size, hail can cause a variety of damage. The most common damage in terms of insurance claims is damage to houses and vehicles. Hail pounding onto vehicles dents the body panels. The larger the hail, the deeper the dents. Side panels may also be damaged with rebounding from the ground onto the side of the vehicle. Effects of hail damaged cars with dented panels can sometimes be seen for weeks or even months after a hailstorm. In previous years, car dealers sold hail damaged cars at reduced prices. 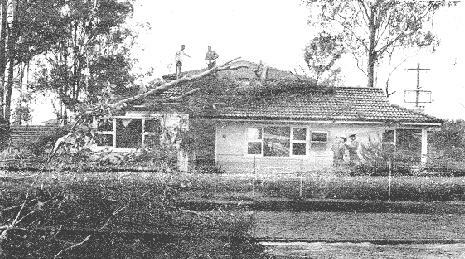 However, there seems to be a tendency to use flexible shade materials (normally used for preventing damage to fruit in orchards) to prevent hail from damaging cars in car yards since the March 18 1990 hailstorm in Sydney. Damage to houses is very much dependent on hail size and wind strength. Hail of around 2cm causes minimal damages to houses. With strong winds, windows may break. Damage associated with larger hail consisting of diameters 5cm or greater includes broken windows as well as roof tiles. Larger hail with strong winds are devastating. Roof tiles are completely destroyed typically on side of tilted tiled roofs. Water may enter and therefore damage occurs inside the house. With strong winds, windows facing the strong winds will be shattered by large hail. The most visible sign of particularly severe hailstorm consisting of large hail driven by strong winds in residential areas are tarpaulins covering roofs with shattered tiles. These are used to prevent leaks and further damage from future rain until the damage is repaired. In rural districts, hail is the most feared of all weather phenomena. Even hail of small diameters with strong winds are sufficient to damage crops. Small hail with strong winds can pierce crops such as lettuce and cabbage. Such crops will be worthless. Larger hail can also damage crops even with lighter winds. Strong winds and large hail will totally destroy crops as well as injure or kill livestock. Because of the effects of decaying crops or carcasses, farmers remove them within a few days which in effect removes the evidence of hail. In some rural and most residential areas there are trees. Trees give some of the best indications of large hail affecting a region within the previous few weeks. Unusually large amounts of stripped leaves after a storm underneath or near the tree is normally a sign of large hail especially where one area is affected and an area nearby is untouched. With high winds, large hail can also debark the trees on one side obviously facing the wind. 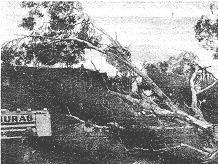 This effect was observed in a severe thunderstorm that effected Singleton north of Sydney on the 11th December 1996. Straight line winds can occur locally with most severe thunderstorms, but in particular systems of storms along a line known as the squall line and supercells. Basically, straight line winds are defined as winds that do not clearly show signs of convergence or divergence locally. Damage usually consist of felled trees, unroofed houses, downed power lines and poles, and overturned vehicles. From the effects of the damage, the direction of the straight line winds can approximately be determined. Trees and poles will mostly be felled in the direction of the wind. Debri including branches of trees will also be blown in the direction of the wind. Cars or other vehicles as well as buildings can be damages by falling trees. Copyright of newspaper photos unknown. Microbursts or downbursts are winds that descend from the cloud base down to the ground in some severe thunderstorms. 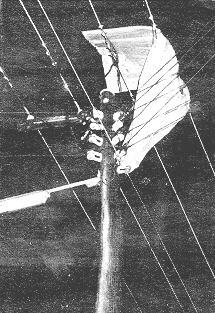 For many years, microbursts were considered the highest cause of aircraft accidents. Because of the toe-shaped horizontal circulation, a plane must quickly recover from one vertical motion to another. In recent years, aircraft in Australia have been refused permission to land during severe thunderstorms. 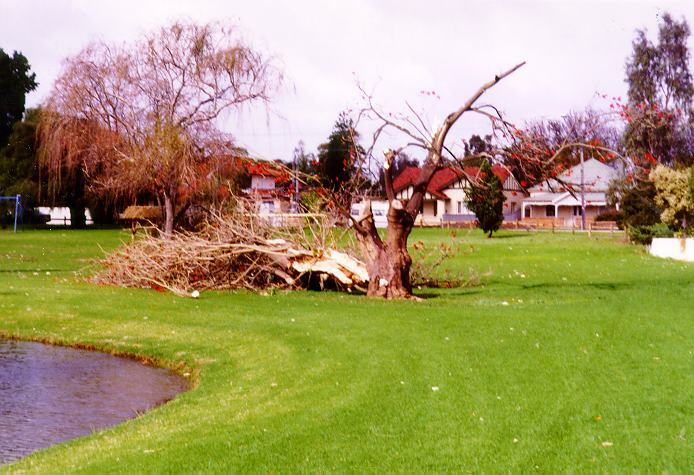 Microbursts and downbursts can cause other forms of damage. 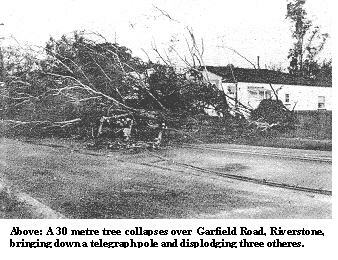 Their downward and horizontal motions have snapped trees, unroofed houses, and in particular levelled areas of forests. 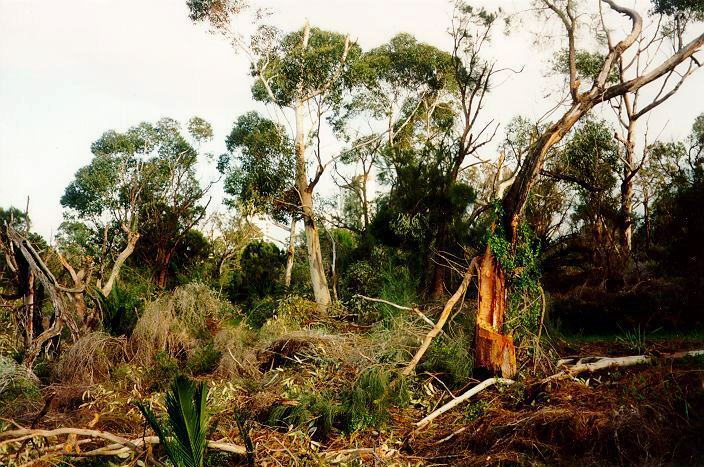 It is the levelled forests that leave the most visible sign of microbursts, in particular, microbursts occurring from smaller severe thunderstorms. The downward flowing winds leave patterns of divergence (outward spreading wind flow) which was opposite to the inward convergent flow associated with tornadoes. In some severe thunderstorms, several microbursts can occur at different times which mean that different regions along the storms' paths will show the effects of the various microbursts. 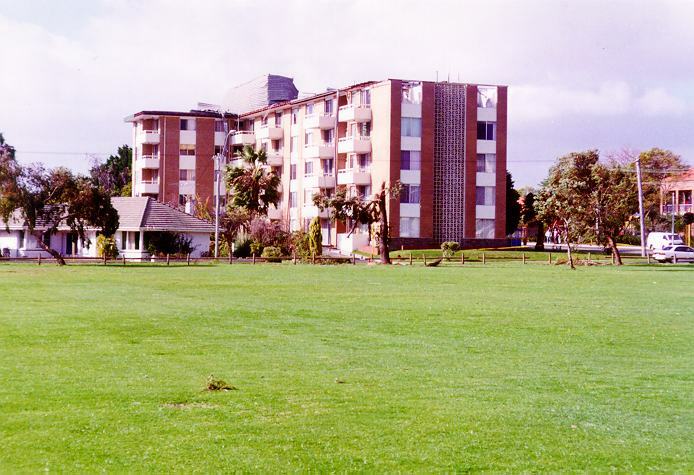 This was especially the case in the severe thunderstorm that occurred in Sydney on January 21 1996. 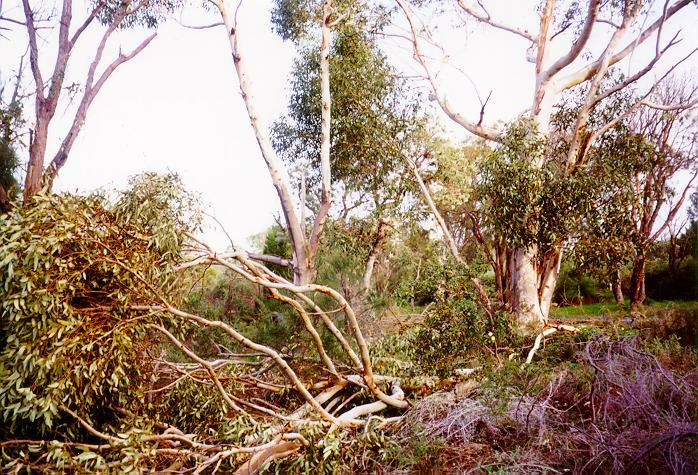 Down forcing winds occurred in various sections of the Kuringai Chase National Park located to the north of Sydney. Areas of forest were levelled in several regions of the forests indicating separate down flows with winds up to 230km/hr. The effects of flash flooding and general major flooding can vary considerably and typically depends on the severity and the type of region where the flash flooding occurs. A flash flood, as the name incurs, is defined as a sudden rise in water in short duration from heavy rainfall in severe thunderstorms. Such thunderstorms are usually slow moving and therefore are able to dump very heavy rainfall in a period lasting from several minutes up to several hours. The heavier the rainfall intensity and the longer the duration, the more damage that will take place. 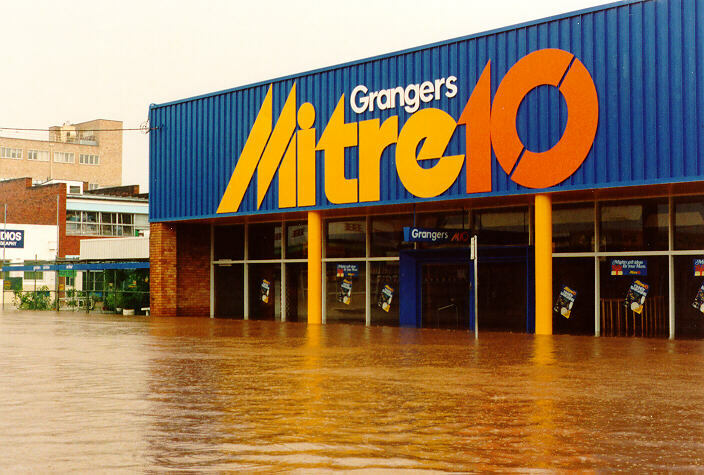 Major flooding occurs when long periods of heavy or steady rain causes rivers to rise and eventually if the rain persists, flooding will occur. It is a slower process and lasts longer. Sometimes, the onset of heavy rain causes local flash flooding and then the prolonged event leads to major flooding of rivers. As mentioned above, flash flooding tends to occur with slow moving severe thunderstorms. This means the intense heavy rain area will take longer to move and therefore dump heavy rain over a certain region for long periods of time. 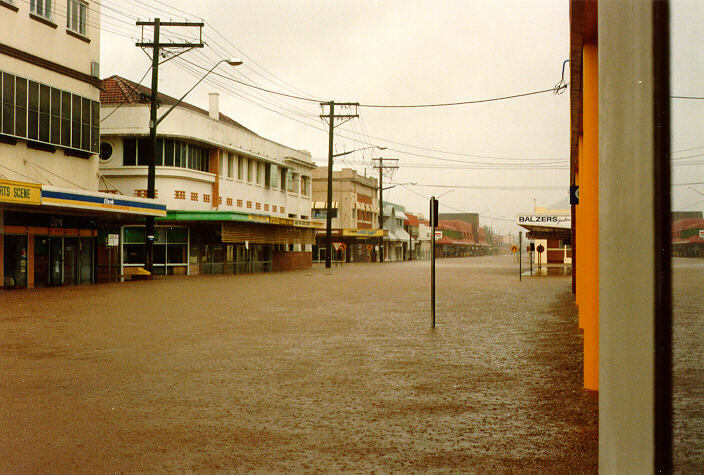 Some regions are susceptible to more flash flooding than others. The flash flood normally occurs in low lying areas but can and does occur where a slight water course can be formed. It may be higher ground but water may collect up in slight valleys very quickly and still cause considerable damage. 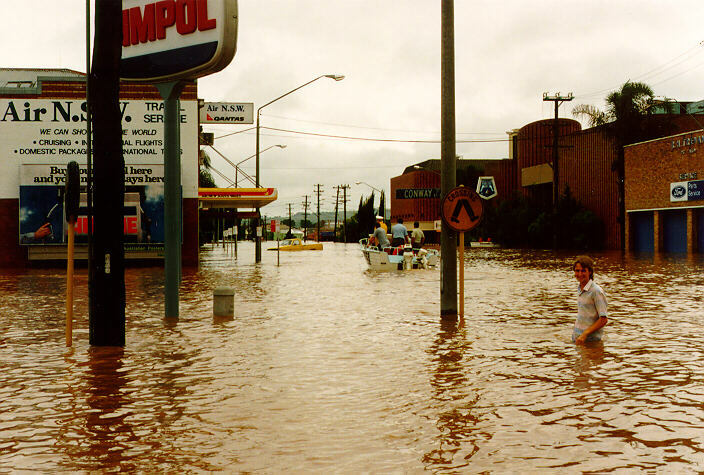 Due to urbanisation such as the Sydney region, residential areas have had increases in the amount and severity of flash flood events. 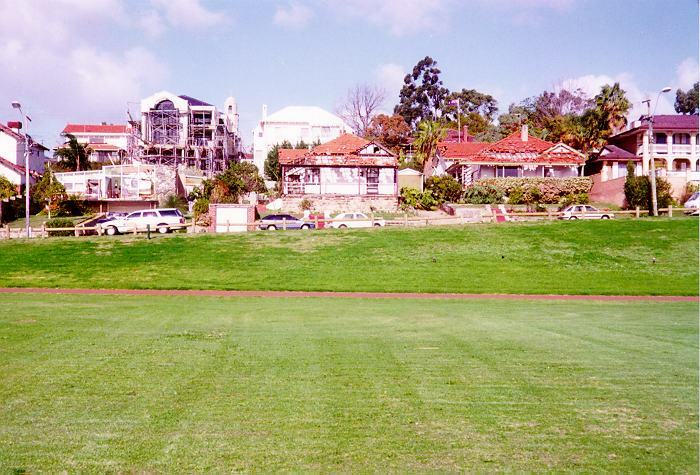 This is due to the covering of soil by houses, roads, and concrete associated with urbanisation. This means that water cannot sufficiently infiltrate the soil and runoff increases. This could mean that areas not previously associated with flash flood events can become flash flood region or areas prone to flash flooding can have increased frequency and intensities of flash floods. 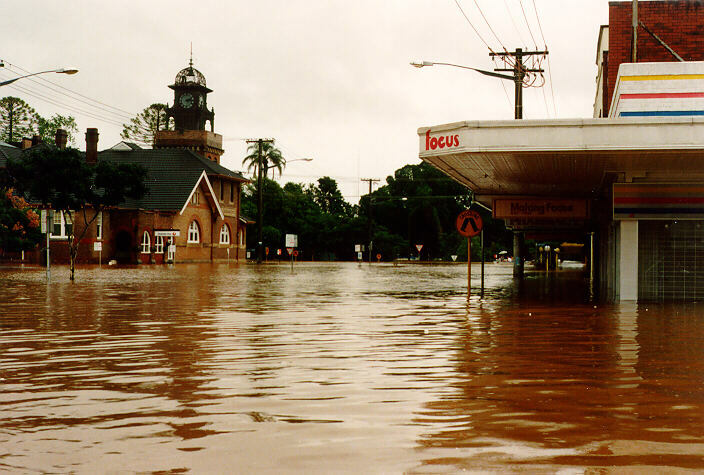 Recent government in some countries including Australia are introducing in their planning of new residential areas flood prevention programs. This includes improved drainage systems as well as development of small catchment dams to collect water. This means that excess runoff collects into the catchment so that creeks downstream do not have an increased volume of water which would normally lead to flash flooding. This water is released but over a period of a few hours or so. Major flooding tends to occur on a macroscale with larger areas affected and lasting for longer periods. The types of associated weather conditions are typically larger scale synoptic situations such as extensive cloud bands and low pressure areas. 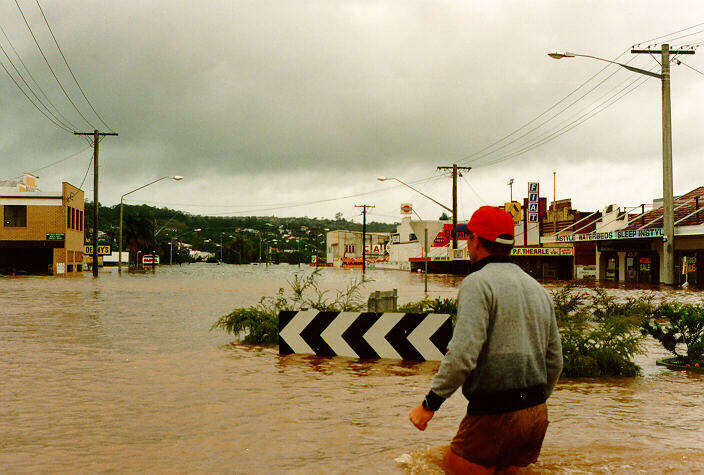 The factors such as urbanisation definitely still has an impact during major flooding but small catchment dams are not effective during long periods of heavy rain. Flood control in major flood cases has been achieved through construction of major dams. These dams act as a water supply reservoir for agriculture, industry and human construction but are built downstream of river catchment areas to reduce the frequency and intensity of major flood events. The types of damage that occurs depends on the surroundings and type of land use. Most damage from flooding is similar but very severe flashflooding can cause more structural damage at times. 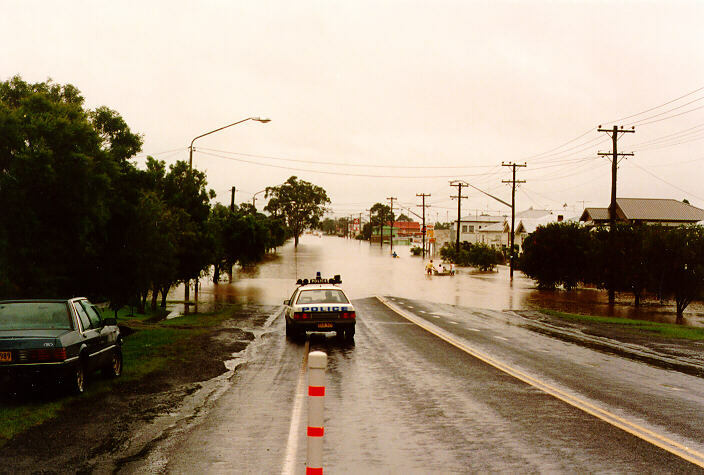 During flash floods, runoff can increase suddenly. Water from different areas of one catchment region meet up and therefore rises rapidly. 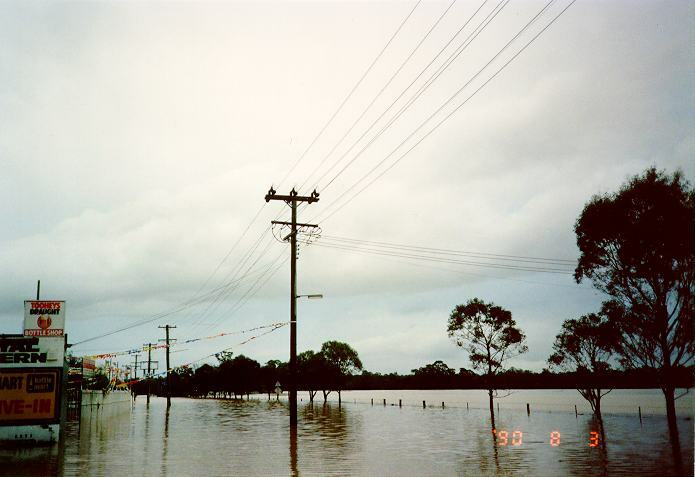 Sometimes, a wall of water one metre high or even higher can hit an area. Damage in this case can include water damage inside houses, cars carried away and houses shifting of their foundations. In severe cases, even trees are carried and mud slides or land slips can result in houses collapsing because of weakened foundations. Sometimes, bridges are also destroyed. This means drivers of vehicles should not enter flooded zones. In many cases of severe flash floods, people have drowned because of the lack of warning. 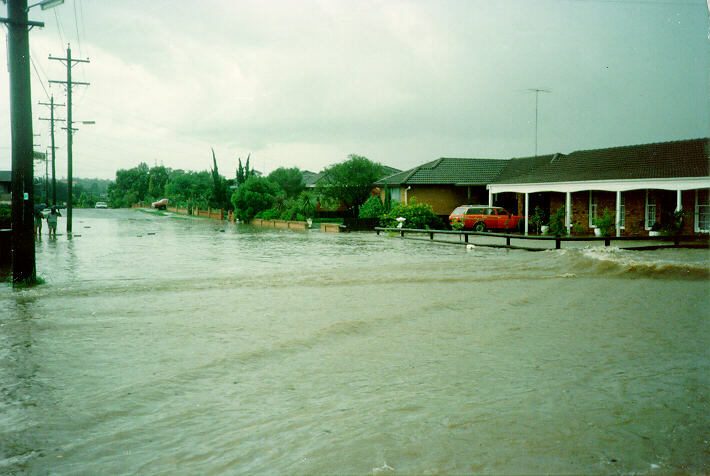 Flash floods can occur very soon after the onset of heavy rain. 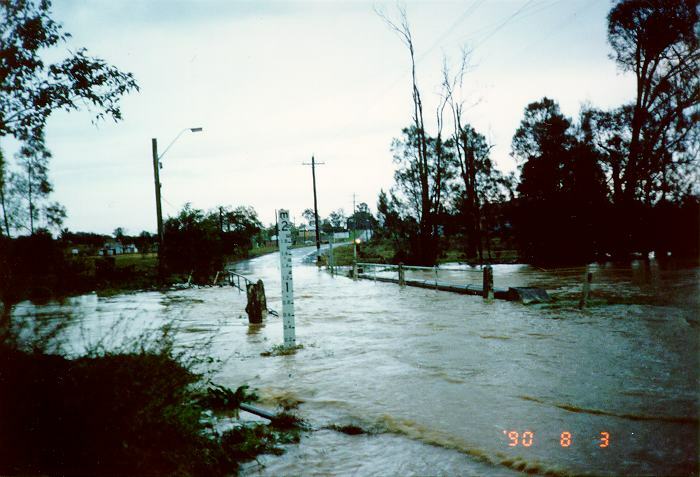 In some cases, flash floods can occur outside the area of rain where it may be dry but the excess water can flow into the dry region which is downstream. This flow can take minutes to hours to flow. Sometimes the storm is gone and the flash flood is still raging downstream particularly in mountainous regions. Some people have been caught by surprise in these situations. It is therefore vital for people to have some weather observational skills to understand what is going on in nearby regions. What is important to note is that if such damage is observed, it is likely that flooding or flash flooding has occurred. The damage and effects that have been mentioned are things to look for after the event. Further, there are signs such as leaves, branches or simply stain marks on fences, poles or buildings that indicate water has reached that height. Rivers flowing faster than normal and abnormally muddy brown from previous rain is not uniquely a good sign of flooding. Another easy way that any type of severe aftermath can be observed is by referring to the media if available. The media is a good source of visual verification of the aftermath of severe weather events particularly television. However, due to the lack of knowledge of some (or most) reporters, as well as being prone to over-exaggeration to glamorise the event, people should make up their own opinion based on what evidence is shown.